The destructive wildfire sparked during an unusually dry December scorched hundreds of square miles in Southern California, destroyed more than 1,000 homes and other buildings, and left two people dead, including a firefighter. Major brush fires across Southern California destroyed more than 1,000 homes and buildings, forced at least 190,000 people to flee, and left two people dead. The largest blaze, the Thomas Fire, scorched 440 square miles in Ventura and Santa Barbara counties, becoming the largest wildfire in California history. The blaze was blamed for the death of a woman who crashed her car while trying to evacuate, as well as a firefighter. The fires were driven by ferocious winds, dry vegetation, and low humidity. Officials said the Skirball Fire, which destroyed six homes in the upscale Los Angeles neighborhood of Bel-Air, began with an illegal cooking fire in a homeless encampment. A powerful storm later dropped several inches of rain on the Thomas Fire-ravaged hills of Santa Barbara County, prompting mudslides that left 17 people dead. Firefighters monitor the Thomas Fire on Dec. 16 in Montecito, California. More than a month after it erupted, the largest wildfire ever recorded in California is 100% contained. The Thomas Fire began on Dec. 4 and eventually burned more than 281,000 acres, or 440 square miles, in Santa Barbara and Ventura counties. Officials said Friday the fire was finally fully contained. The blaze was blamed for the deaths of a firefighter and a woman who crashed her car while evacuating. It also destroyed more than 1,000 homes and buildings. The blaze was fueled by unusually hot and dry winds in December. A California Department of Forestry and Fire Protection incident report pointed to "the absence of any significant precipitation" during what would normally have been the wet season, leaving brush "critically dry across much of Southern California." Weather conditions cooled significantly in January, and a powerful storm dropped several inches of rain on the newly charred hillsides, prompting mudslides that killed 17 people, and destroyed 65 homes in the Montecito area. California's second largest wildfire on record burned 273,000 acres in San Diego County in 2003 and was blamed for 15 deaths. CalFire described the Thomas Fire as "unprecedented for December and January." The Thomas Fire, which has been burning through Southern California for 20 days, is 86% contained as of Sunday, according to Cal Fire. It has burned a total of 281,620 acres. Fire officials said that no forward progress of the fire is expected, partially because there is no significant winds. 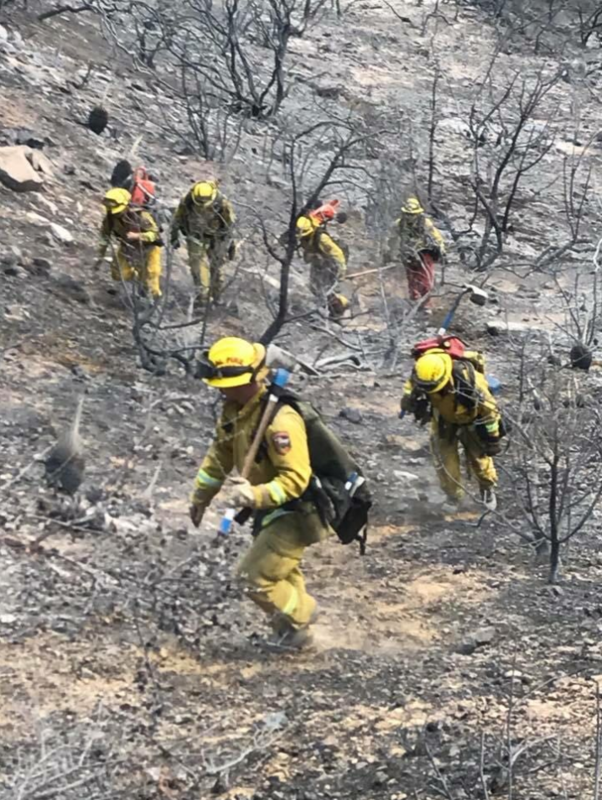 "Firefighters are building upon previous gains by strengthening established containment lines adjacent to communities and other infrastructure," Cal Fire officials said in a news release. "Mop up operations along the fire perimeter and active patrol are ongoing." They also said that firefighters and aircrafts would remain in the area to help put out any flareups or new fires. Additionally, officials warned wildlife might be seen in residential areas in Santa Barbara and Ventura counties as they become displaced because of the fire. Cal Fire advised that anyone who encounters a displaced animal should "maintain a safe distance, refrain from feeding them, and if a threat to humans is perceived call 911." The stubborn Thomas Fire burning along the Southern California coast reached a new milestone on Friday, becoming the largest wildfire in the state's history. As of Friday evening, the fire was 65% contained after burning 273,400 acres, surpassing the 2003 Cedar Fire that scorched 273,246 in San Diego County, according to Cal Fire. Despite its massive size, the Thomas Fire has so far been less destructive, destroying 1,063 homes and being blamed for the deaths of two people, including a firefighter. The Cedar Fire killed 15 people and destroyed 2,820 homes. The Thomas Fire broke out Dec. 4 in Ventura County and quickly raced out of control, fueled by strong winds and low humidity. Burned hillsides near Carpinteria, California, as seen on Dec. 20, 2017. Officials lifted most evacuation orders Thursday in the area surrounding California's Thomas Fire as crews increasingly gained the upper hand over the massive blaze. The Thomas Fire has grown to 272,600 acres in Ventura and Santa Barbara counties, officials said at a Thursday evening news briefing. It was 65% contained, a 5% increase over earlier in the day, and the progress allowed most people who had fled the blaze to begin returning home. The fire is currently the second largest ever recorded in California, after only the 2003 Cedar Fire. At the briefing, Ventura County assistant Sheriff Bill Ayub described the blaze as "unprecedented in size and scope and area of impact." However, the conditions officials described Thursday stood in stark contrast to the scene a week earlier, when hot and dry winds fanned the flames into a raging inferno. Many fire crews have since been released, Cal Fire operations section chief Mark Brown said, and Thursday was "one of those days where our firefighters had to work hard to find smoke." "They had to work hard to find the hot spots," he continued. "They did find some and they're out there cooling them off, working them, putting water on it, using their hand tools to stir it up and to ensure that those hot spots are gone once and for all." Firefighters haul equipment in Santa Barbara, California, Tuesday. California's second-largest wildfire on record, which erupted more than two weeks ago in Ventura County, is likely to continue burning well into 2018. Daniel Berlant, an assistant deputy director for Cal Fire, told BuzzFeed News that more than 6,500 people were still on the ground battling the Thomas Fire Wednesday, and that crews would likely stay on the scene fighting "well into the new year." "The fire season of 2017 will continue through 2018 without an end," Berlant said, adding later that "really this is becoming the new normal as far as the severity." As of Wednesday morning, the Thomas Fire had burned 272,000 acres, making it the second largest wildfire ever recorded in California. The biggest blaze, the Cedar Fire in 2003, was only about 1,200 acres larger than the Thomas Fire's current size. Berlant said the Thomas Fire was 60% contained as of Wednesday afternoon, adding that cooler, calmer weather recently gave crews the upper hand. However, the return of hot, dry wind was expected later Wednesday, prompting concern that the flames could again spread more rapidly. "We have a lot of firefighters still assigned the try to hold back the fire so we don’t have the kind of extreme behavior had earlier on," Berlant explained, "but it depends on the weather." Berlant described the situation facing fire crews over the coming days as "challenging," but added that 60% containment "is really starting to turn the corner." When The Fire Comes For Your Home, What Do You Take With You? Flames burn near power lines in Montecito, California, on Saturday. The massive Thomas Fire burning in Southern California continued to expand in size Tuesday, becoming the second-largest blaze in the state’s history even as crews made steady gains in their battle to control the flames. The fire, which erupted two weeks ago, had burned 272,000 acres in Ventura and Santa Barbara counties as of Tuesday night, surpassing the 2012 Rush Fire by about 100 acres, which burned in Lassen County. California's largest wildland blaze on record, the Cedar Fire, burned 273,246 acres in San Diego County in 2003. As of Tuesday night, the Thomas Fire was 55% contained, up from 50% earlier in the day. It had destroyed more than 1,000 buildings and threatened another 18,000, according to Cal Fire. The Thomas Fire was part of a series of late-season blazes that erupted in Southern California amid particularly hot and dry weather. Intense Santa Ana winds, which blow from California's deserts toward the more populous coasts, have made fighting the blazes particularly difficult. Two people have died as a result of the Thomas Fire: a woman who was killed after crashing her car during the evacuation, and a Cal Fire engineer. More than 8,000 firefighters were battling the Thomas Fire, officials said, and evacuations remained in place Tuesday for portions of both Santa Barbara and Ventura counties. Fire fighters in a in Montecito, California, on December 16. The third-largest wildfire in California history continued to grow Tuesday, reportedly prompting the largest mobilization of firefighters in the state's history. The Thomas Fire, burning in Ventura and Santa Barbara counties had scorched 271,750 acres as of early Tuesday afternoon, according to fire officials. More than 8,200 firefighters were involved in the battle against the blaze, officials said, which the Los Angeles Times reported was the largest personnel mobilization in the long history of California wildfires. Officials estimated the cost of fighting the fire at $140 million —&nbsp;about the same amount of emergency funding Cal Fire spent fighting blazes during the entire fiscal year spanning 2011 and 2012. Unusually warm and dry weather coupled with fierce winds have fanned the flames since they first erupted in Ventura County two weeks ago. In September 2015, Los Angeles Mayor Eric Garcetti and other municipal leaders stood on the grounds of City Hall, declared homelessness a "crisis" and an "emergency," and vowed to combat the problem. But two years later, the number of homeless people living in LA — and nationally —continues to swell, posing a complex set of problems for health and public safety that local governments have struggled to manage. The potentially disastrous consequences of this crisis were thrown into relief early this month, when a cooking fire from one of LA's many newer homeless encampments quickly erupted into a 400-acre wildfire that burned down six homes and damaged 12 others before crews finally contained it last Friday. No one has yet been arrested for starting the Skirball Fire, which burned above the tony neighborhoods of Bel Air and Brentwood. But the incident served as a reminder that after years of trying, numerous US cities — many of them on West Coast — have been unable to stem the growing tide of people experiencing homelessness on their streets and wildlands. A fire crew in Santa Barbara, California, on Sunday. The third largest wildfire in modern California history continued to grow Monday, even as weather conditions allowed crews to increase containment. The Ventura County Fire officials said the Thomas Fire had grown to 271,000 acres by Monday evening, up about 1,000 acres from earlier in the day. Crews managed to increase containment from 45% to 50%, the department said. The blaze, now in its third week, continues to inch higher in the record books; as of Monday evening it remained the third-largest fire in California history, but was within about 1,000 acres of the second-largest fire and about 3,200 acres of the biggest fire ever in the state. The slower growth and increased containment were welcome news for fire crews battling the blaze since it erupted two weeks ago. 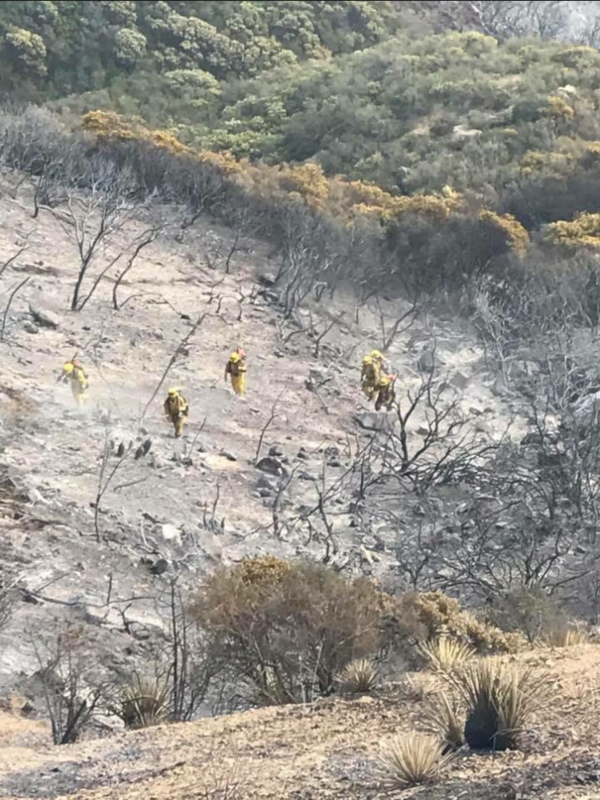 According to the Ventura County Fire Department, the "weather was cooperating with crews on the line today" and some crews were released to return home. Heavy fire burns around power line towers near Montecito, California, Saturday. As winds died down Sunday, firefighters battling the Thomas Fire in Ventura and Santa Barbara counties were looking to take advantage of the turn in the weather to renew their attack on the third-largest wildfire in California history. After stronger-than-expected winds pushed the flames deeper in Santa Barbara County Saturday, resulting in what a Cal Fire spokesperson called "one heck of a firefight," fire crews were able to resume more defensive work Sunday, dropping fire retardant and cutting fire lines to try to contain the blaze. Red flag warnings for Ventura and Santa Barbara counties were lifted Sunday night, and meteorologists with the National Weather Service said winds are expected to be much lighter on Monday and Tuesday. "We want to make sure we get a hold of this thing before Wednesday," Captain Rick Crawford, a spokesperson for Cal Fire, said Sunday. At least 1,020 structures, including roughly 700 homes, have been destroyed by the fire so far. But officials said Sunday that preventative measures taken before the weekend helped firefighters protect more than 1,000 other buildings and homes as the flames advanced Saturday. As of Sunday night, the fire had burned through 270,000 acres, and was 45% contained, according to Cal Fire. More than 8,500 firefighters are currently working to battle the blaze, the largest mobilization for any fire in state history. The costs of fighting the fire are approaching $117 million, officials said, although the price tag is expected to grow. Earlier Sunday, a funeral procession was held for firefighter Cory Iverson, a 32-year-old Cal Fire engineer who died Thursday of burns and smoke inhalation while fighting the Thomas Fire. As the procession traversed multiple counties across Southern California, ending at Iverson's home in San Diego, firefighters and other first responders gathered on freeway overpasses to pay their respects. Pasadena Fire saluting processsion for Cal Firefighter Cory Iverson. We will never forget! The third-largest fire in California's history has grown by 10,000 acres since Saturday, fueled by intense winds and low humidity. The fire had burned at least 269,000 acres with 40% containment, threatening 18,000 structures as of Sunday, authorities said. However, firefighters managed to save hundreds of homes in Montecito on Saturday as the fire raged in Santa Barbara. The National Weather Service issued red flag warnings for much of Los Angeles and Ventura counties on Sunday, stating the potential for rapid fire spread due to strong Santa Ana winds. Cory Iverson, a Cal Fire engineer killed while battling the raging Thomas Fire this week, died of burns and smoke inhalation, Ventura County's Medical Examiner's office said Saturday. Details of how the 32-year-old was killed were not immediately released, though Cal Fire officials have said an accident review will be conducted in the case. An autopsy was conducted Friday to determine the cause of death. Iverson, from San Diego, had been with Cal Fire since 2009. He was married and had a 2-year-old daughter with his wife, who is five months pregnant. Since his death, more than $300,000 have been raised in a GoFundMe campaign for the family. According to the page, the funds will go toward funeral and daily expenses for Iverson's family. Emergency officials warned residents in parts of Santa Barbara County to evacuate on Saturday as the enormous Thomas Fire continued to blaze. The local Office of Emergency Management said there was a mandatory evacuation order for parts of Montecito, Summerland, and the city of Santa Barbara. Other areas were under voluntary evacuation orders. "If you are in this area, leave now," officials urged. Reporters on scene shared photos of the fast-moving flames, which are being fanned by extremely gusty winds. The Thomas Fire is now the third-largest blaze in Californian history, according to the governor's Office of Emergency Services, as well as the seventh-most destructive. The enormous Thomas fire blazing in southern California is now 40% contained, an increase of 5% from Friday, but high winds are expected to worsen conditions, authorities reported Saturday morning. The Thomas fire has grown to 259,000 acres, according to the Ventura County incident report. The cost of the fire is now estimated at over $103 million. At 2 a.m. local time, a Red Flag warning was issued because of strong winds, which may worsen conditionsaccording to local news station KEYT. "Gusty northwest to north winds will develop this morning across the Santa Barbara South Coast and adjacent Santa Ynez Mountain Range, especially affecting the Gaviota and Refugio areas," read a wind advisory alert issued Saturday morning by the National Oceanic and Atmospheric Administration. A wind advisory is in effect from 6 p.m. Saturday to Sunday afternoon. “Critical fire weather combined with very high fuel loading, critically low fuel moistures, and single-digit relative humidities will continue to support fire growth on the west, east and north sides of the fire,” fire authorities warned. No additional structures burned overnight, according to officials. As the Thomas Fire continued to grow in Ventura County on Friday, firefighters prepared for more challenging conditions ahead. The fire grew to 256,000 acres, or 400 square miles, as of Friday evening with 35% containment, CalFire said. More than 8,000 personnel were fighting the fire, which has burned for 12 days and destroyed 1,009 structures. The cost of the fire is estimated at $96.9 million to date. In spite of firefighting efforts, CalFire spokesman Bill Murphy said weather conditions and challenging terrain would continue to drive the fire. Officials warned residents to be ready to evacuate if necessary. "We're not out of the woods yet," he said. "The firefight continues." Sundowner winds — northerly offshore winds in the Santa Barbara area — were forecast for Friday and Saturday night, officials said. That could bring gusts of 30 to 40 mph to ridge tops. Already, most fire activity was at higher elevations, where steep terrain made firefighters' response particularly difficult. A CalFire engineer was killed on Thursday while fighting the Thomas Fire in Ventura County, officials said. He was identified as Cory Iverson, a fire engineer from San Diego. "More details will be made available as they are confirmed," CalFire Chief Ken Pimiott said in a statement. "In the meantime, please join me in keeping our fallen firefighter and his loved ones in your prayers [and] all the responders on the front lines in your thoughts as they continue to work under extremely challenging conditions." As of Thursday evening, the Thomas Fire was had burned 249,500 acres with firefighters achieving 35% containment. Critical fire conditions were forecast to continue until 10 a.m. Friday. "This is a massive fire. It is burning in very, very challenging terrain, in country that hasn’t burned in many years," CalFire's San Diego Chief Tony Mecham said. "And by all indications, this is a fire that is going to burn for several more weeks especially as it moves away from populated areas." Iverson, 32, had been with CalFire since 2009. He is survived by his wife, who is five-months pregnant, as well as their 2-year-old daughter. The fire engineer was dispatched to the Thomas Fire with a 17-person strike team from San Diego on Dec. 5 and had been working since then, Mecham said. On Thursday morning, Iverson was working outside of the fire engine on an active fire near the city of Fillmore, Mecham said. More details about his death were not immediately available, but CalFire will conduct an official review. No one else was injured. Many friends and extended family members of Iverson's had ties to firefighting, Mecham added. "The family wanted me to specifically share with you tonight that Cory was a well-respected and dedicated firefighter who always put his crew first," Mecham said. "He was focused on training and improving his crew and making sure that his folks were taken care of." Iverson was a very experienced firefighter, Mecham added, having previously served at the Hemet-Ryan Air Attack Base as well as the aviation firefighting program in Tuolumne County. "Cory’s just a great young man, and he was somebody that really loved this job," Mecham said, growing emotional. "He took great pride in wearing the CalFire patch. He was an extraordinary firefighter." Iverson's death comes as California firefighters have been stretched between multiple destructive and deadly fires for months. Traditionally, wildfires have struck the state during the fall, with fire season ending by December. "Normally at this time of year, we’re slowing down and we're starting to focus on spending time with our family and enjoying the holiday season," Mecham said. "We still have thousands of firefighters on the front lines and tonight we’re just dealing with the tragedy. It is overwhelming for all of us." Fire hand crew member Nikolas Abele keeps an eye on a hillside for any stray embers during a firing operation in Santa Monica Canyon in Carpinteria on Dec. 11, 2017. The stubborn Thomas Fire burning along Southern California's coast has become the fourth largest wildfire in the state's history. As of Thursday morning, the fire had consumed 242,500 acres and was just 30% contained after starting Dec. 4 in Ventura County. It has since destroyed at least 970 buildings, including 700 homes, as it burns north into Santa Barbara County, prompting mandatory evacuations for tens of thousands of people along the way. Meanwhile, thousands of firefighters are working to protect homes in Montecito, Summerland, and Carpinteria. The cost of fighting the huge blaze also continues to go up, nearing $75 million so far, according to Cal Fire. The unusually hot and dry weather conditions fueling the wildfires burning in Southern California are expected to last longer than any such event on record in the region, meteorologists said. On Tuesday, the National Weather Service office in Oxnard extended a Red Flag Warning — an alert that fire conditions are expected — until Friday. The warning was first issued on Dec. 4, meaning the conditions in some areas are expected to last a total of 11 consecutive days. Though the weather service doesn't keep extensive records on the duration of red flag warnings, Kathy Hoxsie, an NWS meteorologist, told BuzzFeed News the "very unusual" event is longer in duration than any in memory. A database maintained by meteorologists at the weather service since 2004 confirmed the warning currently in effect is the first to be extended by the office for longer than a week, Hoxsie said. "Most of them [red flag warnings] are two to three days. It’s definitely less than a week." The conditions for a Red Flag Warning typically include hot winds blowing from California's deserts toward the coast, which can fan flames and drive embers into the air, as well as extremely low levels of humidity. On Tuesday afternoon, relative humidity in downtown Los Angeles was only 8%, while in Long Beach — which sits directly next to the Pacific Ocean — it was only 4%. "This is really incredible," she said. "Right on the coast. That’s amazing." Southern California normally sees relative humidity figures around 30% in December. During rain storms, it can jump to 90% or higher. "Single digits will always get our attention," she added, "because single digits are hard to come by. You’ve got to have a very dry airmass to get that low." The good news is that winds have slowed in recent days, allowing firefighters to increase their containment of the many blazes charring parts of Los Angeles, Ventura, and other counties. However, Hoxsie said there is some concern that California's current dry weather could foreshadow conditions in the months to come. "The fear is that, we’re far enough into December, that this might be an indication that this is the winter pattern," she said. "That’s not good, because what that would mean is that once we get this fire out we have two or three more months of offshore wind flow." A burnt out house is seen after the Skirball Fire on Dec. 7, 2017. A blaze that destroyed six homes in Los Angeles and burned more than 400 acres began with an illegal cooking fire in an encampment near a busy freeway. The Skirball Fire began Dec. 6 beside Interstate 405 near Los Angeles' tony Brentwood and Bel Air neighborhoods, according to a statement from the Los Angeles Fire Department. No one was present in the area when crews arrived, the statement adds, but investigators have since determined the blaze began with a cooking fire in an encampment that had formed on the brush-covered hills. Authorities have not arrested anyone for their involvement in the blaze. The Skirball Fire did not grow as large as some other blazes, such as the Thomas Fire, currently ravaging areas of Ventura and Santa Barbara counties, but it still destroyed six homes and damaged 12 others, according to the fire department. As of Tuesday afternoon, it had burned more than 400 acres and was 85% contained. Los Angeles has faced a growing homelessness crisis in recent years, with the number of people living on the streets and in encampments skyrocketing. A report from the Department of Housing and Urban Development found that more than 55,000 people are experiencing homelessness in Los Angeles County, only 25% of whom have shelter. One week after it was first sparked, the fifth largest wildfire in modern California history has destroyed nearly 900 buildings in Ventura County, officials said Monday night, though crews have made significant gains in efforts to bring the fire under control. The Thomas Fire has burned 231,700 acres — an area larger than New York City — and was 20% contained as of Monday night, Incident Commander Todd Derum said at a news conference. The blaze, now burning in its second week, is among the top 10 most destructive in state history. The cost of fighting the fire has risen to $48 million, Derum said. While challenging sections of the fire remain, firefighters had "a successful day" fighting the blaze, Cal Fire operations section chief Mark Brown said. The Thomas Fire destroyed a total 525 buildings in the city of Ventura and another 342 buildings in the county, Derum said. Tim Chavez, a Cal Fire analyst, said that the fire was no longer being primarily driven by winds, instead following fuel sources. "It’s what we call flanking fire behavior," he said. "It's just edging down the face of the mountain on both sides." NASA on Monday released a pair of satellite images showing the massive Thomas Fire burning through a vast swath of Ventura and Santa Barbara counties. Officials say the fire has destroyed hundreds of structures, and at more than 230,500 acres, is now the fifth largest ever recorded in California. The images show multiple active fires, a large smoke plume billowing over the coastal city of Santa Barbara, and a expansive burn scar stretching from the rugged Los Padres National Forest to the Pacific Ocean. Fire crews in Southern California continued to make gains Monday against several brush fires that have destroyed hundreds of homes and forced thousands to flee. Increased containment of the Rye and Creek fires to more than 90%, and the Lilac and Skirball fires to 80% or more in Los Angeles, Riverside, and San Diego counties was allowing resources to be diverted to the stubborn and much larger Thomas Fire, officials reported. That fire started Dec. 4 and has already destroyed more than 750 buildings. It was 15% contained after scorching at least 230,500 acres as of Monday, Cal Fire reported. The Thomas Fire, the largest fire currently burning in Southern California, has now grown to 230,000 acres, Cal Fire officials said at a press conference Sunday night. It is now the largest fire in Ventura County's history, and the fifth-largest wildfire recorded in state history. The fire has destroyed a total of 790 homes and structures in and around Ventura County and damaged another 191 homes and buildings. Those numbers are expected to rise as an assessment of the area continues, officials said Sunday. The fire, which began last Monday night, is only 10% contained, down from 15% containment earlier in the day Sunday. There are now 6,000 firefighters working to fight the fires, which have now extended into Santa Barbara County, north of Ventura, officials said. So far, the cost of fighting the fire has been $34 million. Evacuation orders were expanded in the Santa Barbara County areas of Carpinteria and Montecito Sunday, forcing at least 5,000 residents — including Ellen DeGeneres — to leave their homes. Officials said they expected conditions to remain similar to those seen the past few nights, with the blaze propelled by an abundance of dry fuel, rather than by the high winds that drove the fire's rapid expansion across Ventura County last week. #ThomasFire- A home burns early Sunday morning off Gobernador Canyon Road in Carpinteria. Elsewhere in Southern California, firefighters made significant progress in containing the other major blazes that have ravaged the region since early last week. In Los Angeles County, the Rye Fire in Sylmar and the Creek Fire in Santa Clarita were both 90% contained by Sunday evening. The Skirball Fire, in Bel-Air, was at 75% containment. Meanwhile, in San Diego, evacuation orders were lifted for the Lilac Fire, which was 60% contained Sunday after burning 4,100 acres and destroying 181 houses and buildings, including a number of trailer homes. At least 46 horses were killed in that fire, after flames burned through the San Luis Downs thoroughbred training center in Bonsall, California. A firefighter looks out toward the Thomas Fire. The largest of the fires that are currently burning in Southern California, the Thomas Fire, has continued overnight into Santa Barbara County, prompting evacuations in Carpinteria and Montecito. The Thomas Fire grew almost 20,000 acres overnight into Sunday morning, now covering 173,000 acres. Nearly a week since the Thomas Fire began, it is only 15% contained. “These folks have been anticipating this and it hit just as expected — well, a little sooner than was expected — and the people responded accordingly,” said Mike Eliason, the public information officer for the Santa Barbara County Fire Department, according to local TV station KTLA. According to the latest information from Cal Fire, a total of five different fires remain in Southern California. The Creek Fire and the Rye Fire, both in the northern reaches of Southern California, are both 90% contained. The most recent fire, the Lilac Fire in San Diego County, is 4,100 acres and is 60% contained. To date, 834 structures have been burned, forcing 98,000 evacuations and a total of 25,000 homes threatened. Cal Fire reported that 9,000 firefighters continue to be engaged in firefighting operations across the southern portion of the state. Firefighters monitor the Thomas fire as it burns through Los Padres National Forest near Ojai, California. Amid calmer winds, Southern California firefighters began to get a handle on the the largest of the six major brush fires burning across the region Saturday, building containment lines around the flames that have cut a destructive path over vast swaths of the state this week. The Thomas Fire, by far the largest of the six fires, had burned 155,000 acres as of Saturday evening, but Cal Fire officials said they have now been able to maintain containment lines for about 15% of the fire — a welcome bit of good news in Ventura County, where the blazes have raged unrestrained for the past six days. Although the fire has increased in size, Cal Fire officials said Saturday that flare-ups have decreased, and the growth is now primarily driven by an abundance of dry fuel, rather than by the fast, dry winds that pushed the blazes earlier this week. "Today was a successful day in terms of the fire," Cal Fire Incident Commander Dave Russel said at a press briefing Saturday evening. As predicted, the Thomas Fire has now moved into Santa Barbara County and is burning along drainage areas above Carpenteria, officials said. But fire departments have stationed about 50 engines in the area that will move in if the flames begin to spread more quickly. As the winds slow, however, officials said they feel confident they can increase the containment of a fire that as of Saturday evening, had destroyed more than 500 homes across Ventura County. Firefighters have also been able to make gains in the Rye Fire, which has so far burned 6,048 acres in Santa Clarita. There, officials said they have been able to increase containment lines to 65% of the fire. Elsewhere in Los Angeles County, the Creek Fire, which has burned 15,619 acres in Sylmar, is now 80% contained, officials said, and the Skirball Fire, which burned in the wealthy neighborhood of Bel-Air earlier this week, is now at 75% containment. And in San Diego County, the Lilac fire had burned 4,100 acres by the end of the day Saturday, with 50% containment, according to Cal Fire. In a visit to Ventura County Saturday, California Gov. Jerry Brown praised firefighters for their work in battling the massive fires this week. But he added that there is still a lot of work to be done in terms of both fire control and prevention, and cited the fires as further evidence of the ways the state has been impacted by climate change. "We're facing a new reality in this states where fires threaten people's lives, their properties, their neighborhoods, and billions and billions of dollars," Brown told reporters. "This is the new normal and this could be something that happens every year or every few years. It's just more intense, more widespread, and we're about to have a firefighting Christmas." Authorities continued to battle the California fires on Saturday, with the state's biggest, the Thomas Fire, now covering 148,000 acres. The Thomas Fire is now 15% contained, an increase of 5% since Friday evening, according to the Ventura County Sheriff's office. Over 4,000 personnel are working on the fire, and helicopters performed night drops Friday evening. Over 15,000 buildings have been threatened by the Thomas Fire, and 537 of them destroyed. The Lilac Fire in San Diego County is 20% contained and covers 4,100 acres. It has destroyed least 105 structures as of Saturday morning. While the human death toll is currently one, the LA Times noted that at least 66 horses are known to have died in the fires. A military aircraft drops fire retardant on the Thomas Fire in Fillmore, California, Friday. Officials fighting a massive California wildfire lifted a number of mandatory evacuation orders Friday after what they described as a successful day beating back the flames. At a news conference, Thomas Fire operations section chief Mark Brown said residents of the city of Santa Paula could return home. Mandatory evacuation orders also were lifted in parts of the city of Ventura, as well as some unincorporated sections of the county. Brown said the evacuation orders were lifted after a "very successful day on the fire." "The fire behavior has dropped down significantly today," Brown said. The Thomas Fire, which is just one of several blazes burning in Southern California, had scorched 143,000 acres by Friday evening and was 10% contained. Unlike earlier in the week, when flames were driven by hot Santa Ana winds, Friday saw the fire shift to a fuel-driven event, meaning it moved toward dry brush that could quickly combust. "The fire is still continuing to move to the north," Brown added. "It's not with the wind, it's more due to the slope and terrain in that area." Six planes and 24 helicopters were fighting the Thomas Fire, and on Friday alone dropped roughly 712,000 gallons of water on the blaze. A 70-year-old woman whose body was found in a crashed car along an evacuation route was the first fatality attributed to the fast-moving brush fires scorching Southern California, authorities said Friday. The Ventura County medical examiner identified the woman as Virginia Pesola, the Associated Press reported. Pesola, who lived in the Ventura County city of Santa Paula, reportedly died from blunt force trauma, along with terminal smoke inhalation and burns. Pesola had crashed her car in Wheeler Canyon while evacuating from the Thomas Fire. Pesola was a victim of the Thomas Fire, a blaze that has grown to 132,000 acres after igniting Monday night amid strong winds. The blaze spread quickly, destroying hundreds of homes and buildings so far. A group of horse rescuers stages in a parking lot as smoke from the Thomas fire billows over Ojai, Calif., on Dec. 7, 2017. Fueled by erratic, gusty winds, the Thomas Fire hasn't stopped lunging for Ojai since it began Monday. Residents described a nightmare late Wednesday night when flames raced just four miles outside the city. Each morning, though, its residents wake up to a town still standing. Although many people heeded mandatory evacuation orders, hundreds stayed, refusing to leave behind their livelihoods. In a standstill, with nearly all the town's businesses shut and streetlights dark, Ojai residents gathered on street corners to swap stories of how they narrowly beat back the beast. "It was nothing like I've seen. I left and turned around and came back," said Sean Salisbury, crossing his arms and nodding toward his trailer home where he's lived for nearly 20 years. "I was in the Navy. It's my house. I had to fight for it." President Trump on Friday declared an emergency in California as wildfires continue to burn tens of thousands of acres in the state and destroy hundreds of people's homes. Trump ordered federal assistance to the state and authorized the Department of Homeland Security and FEMA to coordinate disaster relief, the White House said. "This action will help alleviate the hardship and suffering that the emergency may inflict on the local population, and provide appropriate assistance for required emergency measures, authorized under title V of the Stafford Act, to save lives and to protect property and public health and safety, and to lessen or avert the threat of a catastrophe in the counties of Los Angeles, Riverside, San Diego, Santa Barbara, and Ventura," the White House said. Six large fires have now burned 141,000 acres of land in California, the public information officer for the California Department of Forestry and Fire Protection said Thursday evening. About 190,000 residents have been evacuated and 23,000 homes threatened, with 5,700 firefighters on the lines still controlling the blazes, according to the authorities. The officer said 500 structures have been confirmed destroyed. Local emergency officials warned powerful winds will continue to feed the flames, heading into the fifth day of firefighting. Fire near the 101 freeway in Ventura. At least 439 homes and other buildings have been destroyed by the raging wind-driven wildfire burning in Ventura County, where firefighters are facing their fourth day against the flames. Another 85 structures have been damaged. The Thomas Fire is the most damaging fire currently burning in Southern California, scorching 180,000 square miles in Ventura County, fire officials said Thursday night. The damage estimate provided by fire officials was a significant jump from earlier in the day when officials said less than 100 structures had been destroyed. Cal Fire Incident Commander Todd Derum said firefighters are still in an active fight against the flames and strong winds, and more homes could still be damaged. "We're still in fire fight," he said. Firefighters battling the Thomas Fire have received much of the equipment needed to fight the massive 115,000-acre blaze in Ventura County, but stubborn winds continue to fan flames, spreading resources thin. With more than 2,500 personnel on hand, firefighters said they were hopping from one neighborhood to another, trying to put out hot spots and at times returning to areas that would suddenly reignite with the help of erratic wind gusts. "We've had such high winds for such a long period of time, that's something we haven't really seen before," Capt. Scott Quirarte told BuzzFeed News. "We haven't had a wind condition like this." The fire has now burned for four days and, on Thursday, firefighters stationed at neighborhoods keeping an eye out for any fires that approached homes. So far, officials said, firefighters have focused on trying to prevent additional damage, and have been unable to devote resources to building a perimeter around the massive fire. As of Thursday evening, the fire was just 5% contained. Containment lines are spread apart from each other and erratic winds that reach up to 60 mph have pushed the fire west toward Santa Barbara, keeping the fire active and tricky to handle, Ventura Fire Department Capt. Robert Welsbie told BuzzFeed News. On Thursday, the blaze moved toward the community of Ojai, forming a fiery circle surrounding the community and prompting evacuations. Fire officials said they are hoping for more resources and help. There is some relief, however. Firefighters said they are now being rotated through 12-hour shifts, instead of the 24-to-30-hour shifts they worked on the first days of the fire. California Gov. Jerry Brown declared a state of emergency in San Diego County on Thursday after a fast-moving brush fire destroyed at least 20 homes. Fire officials said thousands of homes in the community of Bonsall are threatened by the Lilac Fire and more will likely be damaged by the flames. At least two people were suffered burns, officials said. The Lilac Fire was just the latest in a series of brush fires burning across Southern California, destroying homes and prompting the evacuation of thousands of people. Burning off Highway 76 near the tightly packed community of Bonsall, the fire had burned at least 2,500 acres as of Thursday evening, Cal Fire said. With firefighting resources across the state spread thin through, the San Diego Fire-Rescue Department ordered much of its staff to report to work as the threat of wildfires continues throughout the southern portion of the state. Cal Fire officials said they were also requesting aircraft from nearby military bases to help assist in fighting the fire. Evacuation orders that affected more than 150,000 people living near the Creek and Skirball Fires burning in Los Angeles are being lifted, officials announced, allowing thousands of people to return to their homes Thursday night. "We are pleased to be here with some better news today," Los Angeles Mayor Eric Garcetti said at a press conference. Firefighters have worked to keep the two major fires from spreading, officials said, despite strong winds and dry conditions that continue to confront firefighters on the ground. The Creek Fire remains 12,605 acres in size and is 10% contained. Ground crews are expected to be working throughout the night to build containment lines around the fire, Garcetti said. The Skirball Fire, meanwhile, remained at 475 acres and 5% contained. Most residents would be allowed to return after 8 p.m.
Garcetti acknowledged other major fires that are burning throughout Southern California and said Los Angeles would be able to send resources to assist those fires as soon as the fires plaguing the city come under control. Residents describe decisions to stay behind: "You have one second to get out, and you make a choice"
Sean Novack, center, and two of his neighbors look toward plumes of smoke from diminishing flames across a railroad track. Andrew Guernsey had to evacuate twice in one night, but as flames neared his parents' home in Ojai, he and some of the neighbors and off-duty firefighters tried to make a stand. "The flames came to our doorstep," Guernsey, 30, told BuzzFeed News. "Our house is safe for now." More than 50,000 people have been ordered to evacuate as the Thomas Fire has burned through more than 96,000 acres in Ventura County. The fire has been burning for three days, but firefighters remain cautious as strong winds threaten to fuel its size. Despite warnings from public officials, some residents have stayed behind or returned to their homes with flames still burning nearby, hoping to either save their houses or see if they survived the night. Chip Barley was one of those who ran back and hosed down his friend's home in Faria Beach after firefighters had already snuffed out wild flames early Thursday. Ferocious gusts had spread the fire into rows of palm trees, lapping railroad tracks. Above the wind, loud booms sounded from an oil field across the freeway. Barley and several other residents donning fast masks and, specked in black ash, wet their homes, many of them wood. "We got really lucky," he said. "The firefighters were here at the exact right time." Another resident returned after seeing palm trees on her street on fire. It was the second time she was forced to evacuate because of fires in two years. "Every cliche you ever heard is true," she said. "You have one second to get out, and you make a choice." Sean Novack, who lives in a wooden beach house, evacuated his home Thursday morning. He ran back later the same day just to see if it survived the fire. "These fires just keep hopping around and it's like, you think you're in the clear and, an hour later, there's fire basically at your damn doorstep." A fast-moving fire in San Diego County has burned through at least 500 acres within two hours and destroyed five homes, officials said. Dubbed the Lilac Fire, the blaze is the latest in a series of brush fires that have destroyed homes and buildings across Southern California this week. The fire has prompted fire officials to shut down Old Highway 395, between Lilac Road and Highway 76, in San Diego, California's Department of Forestry and Fire Protection said. At least 1,000 structures are threatened, officials said. Officials have also issued mandatory evacuations in the area, including the nearby Sullivan Middle School. Fire officials are asking for help from nearby military bases for aircraft to fight the fire. A Los Angeles County firefighter prepares to battle a hot spot on the Creek Fire in the Lake View Terrace area of Los Angeles. Los Angeles firefighters have made some inroads in the Creek and Skirball fires, hoping to build containment lines before strong winds pick up again, officials said. The Skirball Fire, which began burning early Wednesday morning, was 20% contained as of Thursday afternoon after firefighters built a perimeter on the west side of the fire, Los Angeles Mayor Eric Garcetti told reporters. "We spent a lot of time in the last 24 hours getting a barrier on the west end," he said. The fire, burning in the wealthy neighborhood of Bel Air, destroyed four homes and damaged 12 others, Garcetti said. So far, it has burned 475 acres. The Creek Fire in the Sylmar area was 10% contained as of Thursday, a slight increase from the 5% containment that was maintained Wednesday. The fire has scorched 12,605 acres and destroyed 15 structures so far, Garcetti said. Though the containment lines built have been modest gains for firefighters, Garcetti said they will hopefully help keep a handle on the fires as strong winds continue until Saturday. "These conditions, combined with the heat that is now coming into the area, the dryness, the amount of vegetation in some of the areas that have not burned makes this still a very threatening environment," he said. Pushed by powerful winds, the destructive brush fire in Ventura County, California, exploded to 96,000 acres and raged toward Santa Barbara County and the Ojai region early Thursday morning, prompting mandatory evacuations for hundreds of residents and forcing the closure of the 101 Freeway for several hours. Around 300 residents in the Carpinteria area of Santa Barbara County were evacuated at 1:45 a.m. as the Thomas Fire threatened the community. Officials also closed the 101 Freeway between Santa Barbara and Ventura counties for several hours, before reopening it on Thursday morning. The Thomas Fire, the largest in a series of blazes that have scorched tens of thousands of acres in Southern California and destroyed scores of homes, was 5% contained as of Thursday. The fire began in Santa Paula on Monday before spreading to more than 10 miles — reaching the Pacific Ocean. It prompted Ventura County, Santa Paula, and the city of Ventura to declare a local emergency, with evacuation orders affecting more than 50,000 people. At least 150 structures have also been damaged in the Thomas Fire. White House spokesperson, Sarah Sanders, said Thursday that the White House was in regular contact with FEMA as well as state and local authorities to ensure "that we are ready and able to help when needed and requested by the authorities." The National Weather Service on Thursday warned of "extreme fire danger" in Ventura and Los Angeles counties through Saturday owing to the strong winds that would bring "very rapid fire spread" and "extreme fire behavior" with current and new fires. Los Angeles County officials warned of wind gusts of up to 70 to 80 miles an hour in some areas starting Thursday night. These "hurricane-force winds" were expected to "drive the fire in a way that is unimaginable," Los Angeles County Sheriff Jim McDonnell said. A woman's body was also found in a burn area near Ojai, the Los Angeles Times reported. However, the cause of the woman's death had not immediately been determined, officials said. The fire also tore through several homes and orchards in Ojai overnight. Around 2,500 personnel were working to contain the Thomas Fire on Thursday, which also reached the beach town of La Conchita, destroying at least one house in the small community. The wildfires have caused school districts and universities across the region to remain closed. Multiple school districts, including the Santa Barbara Unified School District and the Ojai Unified School District, closed all schools on Thursday on account of the fire's unpredictability. The Los Angeles Unified School District said as many as 265 schools would remain closed on Thursday and Friday. A fifth brush fire — dubbed the Horizon Fire — broke out Thursday morning in Malibu, officials said. However, around 200 firefighters were able to contain the fire before it damaged any houses. Among the other major fires, the 11,377-acre Creek Fire around the Sylmar neighborhood, which destroyed 15 structures, was 10% contained as of Thursday as firefighters fought high winds, poor access, and steep terrain. The 7,000-acre Rye Fire in Santa Clarita was 15% contained on Thursday, but officials said residents should remain vigilant because of strong winds. The 475-acre Skirball Fire, which prompted the temporary closure of a major freeway and destroyed six homes in the wealthy Bel-Air neighborhood, was 5% contained on Thursday. The fire also threatened the nearby landmark Getty Center and forced more than 700 evacuations in the area. Two other smaller fires that broke out in San Bernardino County — the 260-acre Mountain Fire and the 34-acre Meyers Fire — were fully contained on Wednesday.